Hobbies are hunting and fishing: Buhner is well known for his fishing exploits. Favorite sports announcer is Bob Uecker: Nice pick, especially as Buhner was never a Brewer. Favorite player as a kid was Willie Stargell: Buhner was originally drafted by the Pirates, and Buhner was coached by Stargell in the minor leagues there. 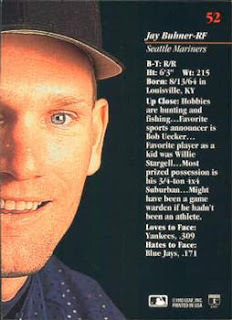 Most prized possession is his ¾-ton 4x4 Suburban: Sports Illustrated’s 1996 profile of Buhner begins with him knocking the mirror of a car with his Suburban and driving away. Might have been a game warden if he hadn’t been an athlete: Makes sense with the hunting and fishing. Where he is now: Buhner is available for corporate appearances and autograph signings. Card Buzz is a blog I had followed for years but had never gotten around to trading with until recently. He has a lot of fun mini-collections so it was enjoyable putting together a trade package for him. The one he sent me was full of great stuff, both hits from my wantlists as well as fun randoms. This iconic card was the last one I needed to finish 1994 Upper Deck. He also knocked out my last 1991 O-Pee-Chee Premier need. I had an autographed copy of this Aaron Judge rookie, happy to get a "clean" version as well. Lots of awesome random stuff, like lots of Mattinglys (no, not an '84 rookie but a '17 Bergers Best) . . .
. . . and Teixeiras. Holy Cow! Phil Rizzuto was my favorite announcer growing up, nice to see a card of him as a broadcaster, even in jest. Hobbies are golf, fishing, hunting and sports: The Darren Daulton Foundation hosted an annual golf outing. Favorite sports announcer is Harry Kalas: Kalas was a longtime Phillies announcer. Favorite player as a kid was Johnny Bench: Good role model for a young catcher. Pet peeves are traffic jams and ignorance: Ironically, as a catcher Daulton wore the “tools of ignorance”. Post baseball career: Daulton died in August after a four year battle with brain cancer. After his initial diagnosis he created The Darren Daulton Foundation which provides financial assistance to brain cancer sufferers. Shortstop Cale Iorg played seven seasons of professional baseball, mostly in the Tigers organization. The son of Garth Iorg and nephew of Dale Iorg, both of whom had lengthy major league careers, he hit .215 with 41 HR, 175 RBI and 67 SB in 548 games. 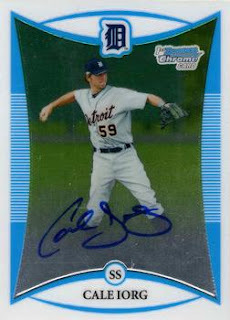 Now a Senior Loan Officer at Supreme Lending in Alpharetta, GA, he kindly answered my questions about baseball cards. "I did have card books as a kid, but my childhood was blessed in that those guys on the cards were right in front of me. Because of that, I never really got too into card collecting, though I did have them. I think the most fun thing surrounding cards now is when a co-worker tells me they saw my card online or someone will text me a picture of my dad’s or uncle’s cards that they found going through old boxes at home. My favorite card memory is the first time I saw my own card. The Topps rep came to my house and I had to sign 1,000 cards and he watched me sign them all. It was crazy. Again, blessed to have had the opportunity to do that on a few occasions. I also remember at my first spring training and there was my card a little girl asked me to sign. It was pretty surreal. I never got tired of signing my cards for people who asked, it always seemed like a “pinch me” moment." This was the last trade I did with Al this year. This was in exchange for a few Keith Hernandez cards. Looks like interest in the '86 Mets is starting to perk up again - he asked me for a few Ron Darlings when he comes back in March. Some shiny, some parallels, a Leaf card of new HOFer Alan Trammell. The Edmonds on the bottom right turned out to be a dupe, up for trade if anyone wants. I had thought my 1996 Topps set was complete but turned out to be missing one card. Fortunately GCRL of Cards as I See Them kindly sent it to me. He didn't ask for anything but I'll be checking out his wantlists to see what I can send him in return. He even through in a couple of extras! Got some cards in a trade with Red Cardboard. Some 2017 Topps needs . . .
. . . some 2016 Leaf Babe Ruths . . .
. . . and some random Yankees. This last group ended up being all cards I had already so are all up for trade. Anyone need an Aaron Judge rookie? Most of these were very recent cards, like 2017 Finest. Always cool to get a rookie card of one of the Yankees' best players. I had never gotten a negative parallel before. My first thought upon looking at this card was that parallels had officially jumped the shark. But I suppose it does look kind of cool in this case, with the big white beard making him look like an old man playing catcher. I know it is fashionable to say you're tired of the 1987 design, but as someone who started collecting that year I never will. I think the shiny refractor looks great. Got a great package of cards in the mail from Once a Cub. He mostly hit my wantlists, whittling down a variety of sets from the mid-90s like Leaf . . .
. . . and Score. But the biggest highlight of the package from this Virginia-based Cubs fan was a near-complete 1989 Prince William Yankees set, most of which he had personally gotten autographed at the time. A Gary Sanchez insert from Gypsy Queen. The Fortune Teller predicted that Sanchez would hit well over 20 HR in 2017. Fortunately the Fortune Teller did not jinx Sanchez, who hit 33. The effect of a throwback uniform on a card with a vintage design works very well here. There was lots of Panini Triple Play in the package. This little guy is my favorite. Anyone have a 1996 Topps Tony McKnight to trade? A few weeks ago I pulled a bunch of Phillies cards for a trade with Rocker Al but ended up with a bunch left over he didn't want. I figured it was a good time for a blind trade with a Phillies collector. I didn't actually know any but I looked around a bit and found Brad's Blog. I sent a box of Phillies his way and he sent me a package with lots of really cool cards. One thing this trade did was make me realize that I had not completed the 1996 Topps set as I had thought. I was double-checking this Mickey Mantle tribute card from that set when I realized that though I had that card, I was somehow missing #18, Tony McKnight. Anyone have one to trade? Maybe someone can use this Mantle in return? This package also made me make some decisions as to what should count as part of my collection. I had been hearing about buybacks for years but had avoided getting any until now, delaying my decision as to how I would treat them until I had my own. I have decided that buybacks are not unique cards but are just regular cards that have been defaced. As it is I needed both of these anyway but wouldn't mind swapping them out for non-buybacks if I come across them. An on-card auto of a one-time Yankee prospect, very cool. I already have this card but of course I am keeping an autographed version. 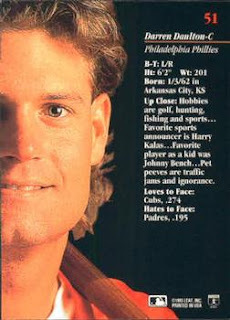 Here is a relic card of an ESPN sportscaster. A relic of a baseball player from A&G counts in my collection. So would a non-player base card. But I think a non-player relic does not count, so this is up for trade. Most of the cards of course were no-doubters. Like this beautiful sepia refractor. Or this fantastic Roberto Clemente card. I love vintage photos of players autographing for fans. Yet another trade with Scott Crawford of I Need New Hobbies, one of my regular go-to trading partners. I finished off his 2002 Topps set (minus one pesky checklist) and also sent a bunch of 1997 Leaf. In return was a trade package with two distinct components. A while back Scott bought a collection with several hundred Cecil Fielder cards. I decided to take one of each that I didn't have already. Ended up getting 37 cards of one of the heroes of the 1996 World Series. Here are some of my favorites. The two on the right are unlicensed. That O-Pee-Chee reminds you of how big he was, best photo in the group. And while I don't usually count Panini stickers as cards, I had never seen these 1991 stickers before - the paperstock is about as thick as a regular card. I think I'll consider it a card. The other half was twelve well-loved vintage Hall-of-Famers. I'm slipping further and further down the vintage rabbit hole. My favorites are my first playing-days card of Bob Gibson, and the '68 Kaline.